Memories from older racing enthusiasts are golden. When recalling the greats from the past to younger racing fans and participants, the newer generations tend to look upon the stories with trepidation and a sense of “yeah sure, that horse was not that good” belief. However, when certain champions from the past are recalled by the wise old observers in great detail, and have the details confirmed by others from the same era, then the young will take notice. Sea-Bird ran only eight times, but he was so impressive and dominant that he left an indelible mark on the memories of those who saw him at his peak. He is widely considered as the best to be seen on European race courses in the twentieth century. The candidates for the title are always debatable. Legends such as Ribot, Nearco, Mill Reef, Brigadier Gerard, Nijinsky, Tudor Minstrel, Shergar and Dancing Brave are always mentioned along with Sea-Bird. This is just in Europe alone. The backers of Sea-Bird as to being the best always mention his flawless action and explosive acceleration against very formidable opponents in his biggest races. I am not saying here that I believe Sea-Bird to be the best, as I never saw him or most of the others in the debates in person. Since I can only view dated film footage of his big races, I do recognize his brilliance and all that has been spoken of him through the media. He was breath taking, no doubt about it. Sea-Bird did not come from highly fashionable breeding. His sire was a good race horse named Dan Cupid, who was a son of the very good race horse and sire Native Dancer. Dan Cupid won five of fifteen races, four of which were stakes victories, and did finish second to champion Herbager in the Prix du Jockey Club. Dan Cupid was trained by Etienne Pollet, who also became the conditioner of Sea-Bird. As a sire, Dan Cupid got a few stakes winners such as multi G2 winner Miss Dan and Prix Lupin winner Dankaro, but no other son or daughter closely comparable to his great son Sea-Bird. The dam of Sea-Bird was Sicalade by Sicambre. Sicalade never won a race. In fact neither had her dam Marmelade, nor did that one’s dam Couleur on the flat either. Couleur did win a race in the jumping ranks however. Couleur’s dam Colour Bar was a maiden as well. So here we have four consecutive non winners of flat racing in direct descent of one of the most revered champions of a century. Unexpected wonder indeed. Marmelade did have a half sister by Maurepas named Camaree who won the 1000 Guineas back in 1950. Camaree is the only other black type winner within the first four generations of Sea-Bird’s tail female line. Sea-Bird was bred and owned by Jean Ternyck and sent the chestnut son of Dan Cupid to his distant cousin Etienne Pollet to prepare for racing. Pollet took his time with Sea-Bird as he was a bit backward and very leggy as a two year old. Sea-Bird made his début in September at Chantilly, winning a seven furlong race after he had missed the break and played catch up to win by a neck. He overcame his greenness two weeks later in the Criterium de Maisons-Laffitte to make it two wins in a row. He defeated the good filly Blabla in the latter race, thus establishing his potential credentials. Blabla would go on to win the Prix de Diane in the following season. Next up for Sea-Bird was the Grand Criterium and a date with his stable mate Grey Dawn, a son of Herbager. Grey Dawn won the race, thus handing Sea-Bird his only defeat in his career, and would be named as the champion two year old in France. Pollet put both of his stars away to prepare for the upcoming classics in the following year. The Prix Greffulhe at Longchamps was the first outing for the now three year old Sea-Bird. He did not disappoint as he won the ten furlong event by an easy three lengths. The next race for Sea-Bird offered to be a stern test of class. The Prix Lupin always attracts a quality field, and the 1965 edition was no exception. In the starting gate were two undefeated colts, Diatome and Cambremont. The latter had defeated Grey Dawn in the Poule d’Essai des Poulins. Despite the stellar competition, Sea-Bird dominated the ten and one half furlong race with a six length win. He stunningly blew past the field and had plenty of gas left in the tank at the end. The racing press stood up and took notice of this exceptional performance. A budding superstar has now emerged. Was he a flash in the pan, or the real deal? The upcoming Epsom Derby should provide the answer. And what an answer Sea-Bird would state! Sent off as the 7/4 favourite, Sea-Bird was barely off the bridle as he cruised on past the very good Meadow Court with a here to fore unseen explosion of acceleration. Sea-Bird was past Meadow Court so quickly, the racing hierarchy were stunned beyond belief. Jockey Pat Glennon had Sea-Bird in sixth place coming around Tattenham Corner and released his mount with two furlongs to go down the home lane. After Sea-Bird had the race well in hand, Glennon then eased him back in the final fifty yards or so to win by a recorded two lengths. Had he not eased Sea-Bird back, the winning margin would have been far greater. There is now a new bona fide superstar to be revered. His name is Sea-Bird and we are not worthy to be in his presence, so say the turf press. To put into perspective the Derby victory by Sea-Bird, Meadow Court later won the Irish Derby and the King George VI and Queen Elizabeth Stakes that year, and Sea-Bird had just made that one look so very ordinary. Sea-Bird reappeared in the Grand Prix de Saint-Cloud and simply cantered by a classy field that included Grey Dawn, Couroucou and Francilius. Again, once he was well past the field and with the finish line in sight, Glennon would power down Sea-Bird before the end of the race. Two and one half lengths was the recorded margin of victory in the twelve and one half furlong race. This race was in July of 1965, and so Pollet decided to rest his super horse until the October running of the Prix de l’Arc de Triomphe. The Prix de l’Arc de Triomphe is the most important weight for age race in Europe. Traditionally run on the first Saturday in October, the fabled race at Longchamps is pointed at by the trainers and owners of the top thoroughbreds of each season. In 1965 this esteemed status for the Arc was vibrant by all who dream of winning the race. The field for this edition was a stellar one. Not only was Sea-Bird entered but also Diatome, who had won the Prix Ganay after his encounter with Sea-Bird and would later win the Washington D.C. International following this race. The undefeated Reliance, who had already won the Prix du Jockey Club, Prix Royal Oak and Grand Prix de Paris was in. Preakness winner Tom Rolfe came over from the US and Coronation Cup winner Oncidium were entered. Old foes Blabla and Meadow Court as well as the Russian champion Anilin, who had won the Preis von Europa, ensured that a formidable and deep field for this running of the great race was on the card. Sea-Bird went to the post as the 6/5 race favourite by the public. After the break, the field was led by Italian champion Marco Visconti until the bend for home when Anilin took the lead with Meadow Court hot on his flank. Sea-Bird was sixth at this point with Reliance close by him. In the blink of an eye the latter two would attack the leaders and flash past. It looked as if the race would come down to a hard fought duel between Sea-Bird and Reliance until the two furlong marker when Glennon let Sea-Bird loose. The smooth running chestnut switched to another gear, fired his afterburners, and literally left Reliance and the rest in his jet stream to win by six lengths. Third placed Diatome was another six lengths in arrears. The move by Sea-Bird to capture the Arc was beyond belief. Never before had a horse dominated as emphatically in such a big race as he had just accomplished. And when the class of the field is considered, the performance becomes even more astonishing! No one who was there could ever recall such a blazing turn of foot with such explosive acceleration from any other horse they had seen. Sea-Bird cemented his legend that day at Longchamps. The accolades poured in toward Sea-Bird after his virtuoso performance in the Arc. Named as the British and French horse of the year, there was no European award at the time, as well as the highest year end compliment of all. Timeform rated Sea-Bird at 145 lbs, the highest rating ever awarded in history. It would take another forty-seven years before a horse surpassed this rating. Frankel earned a rating at 147 lbs in 2012 but it must be said that Frankel never competed beyond ten and a half furlongs. Ternyck retired Sea-Bird to stud at the peak of his career. One would think that such a dominating horse to be sent for stud would have all the top breeding farms falling over themselves in attempting to obtain such a marvel for their stallion roster. Not so with Sea-Bird however as many were sceptical of his pedigree. The best recommendations within Sea-Bird’s pedigree were that he was a grandson of both Native Dancer and the great French champion Sicambre. Sicambre was already known as the sire of six classic winners such as Sicarelle (Epsom Oaks), Ambergris (Irish Oaks), two Prix de Diane winners in Belle Sicambre and Hermieres, Celtic Ash (Belmont Stakes) as well as Cambremont (Poule d’Essai des Poulins) and Diatome (Washington DC International). Native Dancer at this point in time was already known as the sire of champion Raise A Native and broodmare sire of Northern Dancer. This is not to say that breeders were not totally uninterested in breeding to Sea-Bird however. There was keen interest, since such an eye-popping race career would indicate that there are possibilities for Sea-Bird to succeed at stud. 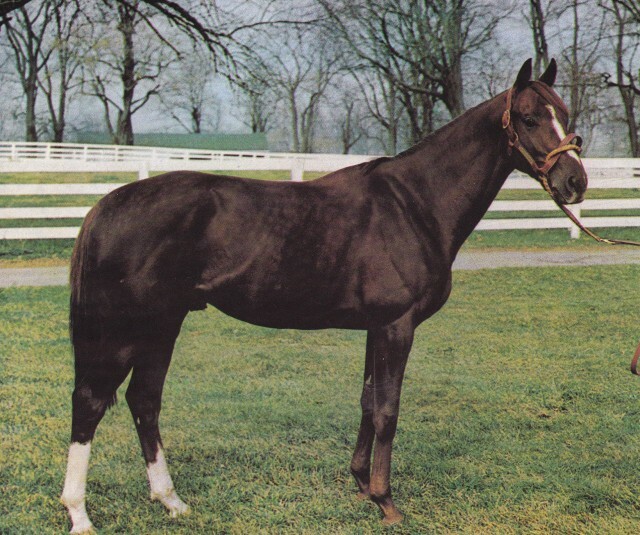 John Galbreath was successful in obtaining a five year lease, at the cost of $1.5 million, to bring Sea-Bird to his Darby Dan Farm in Kentucky, beginning in the 1966 breeding season. The horse would be known as Sea-Bird II while in Kentucky due to name duplication. Sea-Bird became a very good sire, but was not considered a great one. His main claim to fame at stud was as the sire of the great mare Allez France. This wonderful daughter of Sea-Bird captured the hearts of race fans, especially French race fans, with her resounding wins in the Criterium des Pouliches at two, the Poule d’Essai des Pouliches and Prix de Diane at three, and the Prix de l’Arc de Triomphe at four. She also added the group one Prix Vermeille and two wins in the group one Prix Ganay during her marvellous Hall of Fame career. Little Current scored in the Preakness Stakes and the Belmont Stakes for Galbreath’s Darby Dan Farm. The home bred Little Current earned the Eclipse Award as the champion three year old in 1974. Gyr won the Grand Prix de Saint-Cloud and finish second to Nijinsky in the Epsom Derby. Sea Pigeon became a champion hurdler after a very productive career on the flat. Stakes winner Mr. Long became the Chilean champion sire six times. Another top class colt sired by Sea-Bird was Arctic Tern. Looking very much like his dad, although blind in one eye, Arctic Tern was from the same family of Northern Dancer and Halo, being a grandson of Almahmoud. Arctic Tern won three stake races including the group one Prix Ganay and later had a very good stud record. In a nomadic stud career, Arctic Tern stood at four different stud farms, two in France and the US each. He was champion sire in France three times and is the sire of Prix du Jockey Club winner Bering. Among the top producer daughters of Sea-Bird was multi stakes winner Kittiwake. This daughter of Sea-Bird – Ole Liz by Double Jay became the dam of two time Eclipse Award champion Miss Oceana. The Woody Stephens trained Miss Oceana, was winner of six grade one races during her excellent race career. Kittiwake is also the dam of multi stakes winner Larida, who in turn is the dam of Coronation Stakes winner Magic of Life. Irish Bird would be another top producing daughter of Sea-Bird. A winner of one race from three starts, Irish Bird produced two Prix du Jockey Club winners in Bikala and Assert, the latter added the Irish Derby and Benson and Hedges Cold Cup to his win tally, while Bikala would add the Prix Ganay to his resume. Irish Bird also produced the Irish St. Leger winner Eurobird. King’s Swan is another top class stakes winner from a daughter of Sea-Bird. King’s Swan won the Vosburgh Handicap as well as the Bold Ruler Stakes, Tom Fool, Assault (twice), Aqueduct and Stymie Handicaps. Three more are Noble Fighter, winner of the Belmont Turf Classic, Roanoke won the Californian Stakes and Northern Sea, who won the Selima Stakes and later became the dam of leading sire Southern Halo. Sea-Bird sired thirty-three stakes winners from only seven crops of foals. This computes to a very successful strike rate of 18% from all his get. As the sire of the great Allez France, classic winner Little Current, acclaimed hurdler Sea Pigeon and broodmare sire of classic winners Assert and Bikala, Sea-Bird had a very solid if unspectacular sire career. Through Bering and Southern Halo, his name is prominent in many top flight pedigrees around the world. Sea-Bird was returned to his native France in 1972 but would pass away due to colic in early 1973, before he could cover mares for the breeding season. He was only eleven when he died. The great French bred champion was mourned by all who witnessed his phenomenal racing class. Many regard his stud career as disappointing. The lofty expectations for an exceptional champion to reproduce his own brilliance, often skews the reality of his actual stud accomplishments. It is my opinion that Sea-Bird, given his own modest pedigree, was an exceptional sire. There is minimal chance for such an extraordinary race horse to have a son or daughter to match his brilliance. He came close, and I believe that had he lived longer, he would have had greater success with more of his offspring once he returned to France. Sea-Bird is still however regarded as one of the all time greatest race horses ever seen. This fact will never be argued. then to ARCTIC SEABIRD ch. G, THOROUGHBRED, 1989. I’ve had him since he retired from a long racing career, and he is perfectly sound and happy at 26 years of age. He still loves to show off his beautiful dressage moves! He is the perfect horse. Still going – happy & health at 28 years old in Ottawa, ON. Arctic Seabird is a wonder! Misprint Little Current was born in 1971, and raced in the 1974 Kentucky Derby finishing 5th, the took the next 2 jewels of the Triple Crown. He won the Eclipse Award in 1974. The hundreth Running of the Kentucky Derby was an overly crowded field, and it proved to be the traffic that cost Little Current his well deserved Triple Crown.